Fire up the passion in your partnership with a dinner to remember in an equally unforgettable location. Joanna Tovia reveals some of the most romantic restaurants and ravishing private-dining experiences for couples across the globe. This article appeared in volume 27 of Signature Luxury Travel & Style. To subscribe to the latest issue, click here. You’ll need to plan ahead to make this moment happen, but your special someone is sure to appreciate your efforts. The Oberoi Amarvilas is a luxury hotel with clear views of the ultimate monument to love: the Taj Mahal. 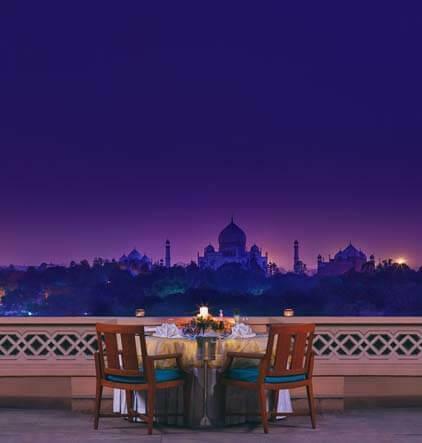 Reserve a room facing the marble Mughal icon during a full moon and book a private, four-course candlelit dinner on your balcony – complete with your own butler – to marvel at the view as the sun goes down. Combine your stay with a Taj Romance spa experience for couples and perhaps even a Hindu renewal of vows ceremony to really show you care. 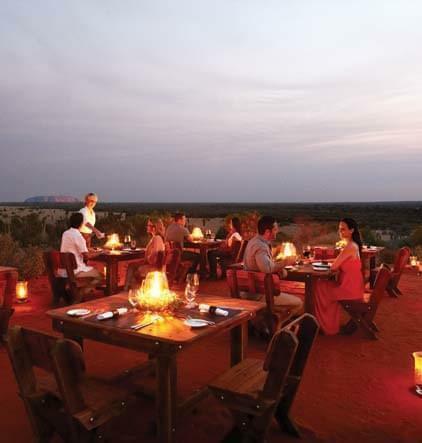 With magical views of Uluru and Kata Tjuta, a Tali Wiru (‘beautiful dune’) dinner in the desert is an intimate and often spiritual experience. It begins with the didgeridoo music resonating into the silence and ends with an Aboriginal storyteller sharing Dreamtime tales after dinner. The Tali Wiru experience is available seasonally, from late autumn to early spring. From mid-spring to early autumn, the Mayu Wiru experience treats a limited number of adults to a private dinner with innovative use of Indigenous flavours, a nightcap and an exclusive tour of the Field of Light art installation in Uluru’s foreground. 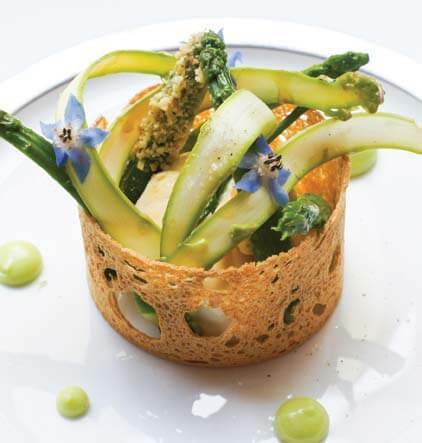 Promising perfection on a plate, The Ritz London’s executive chef, John Williams MBE, never fails to deliver the finest Michelin-starred cuisine against the chic backdrop of Piccadilly’s Green Park. Often described as the most beautiful dining room in the world, the sparkling chandeliers, marble columns and floor-to-ceiling windows serve only to highlight the stellar service and organic food. For romantic theatrical flair, enjoy The Ritz’s own culinary performance with the pre-theatre menu. Starting at 5.30pm, this three-course meal ensures that you’ll make it in time for your West End show. 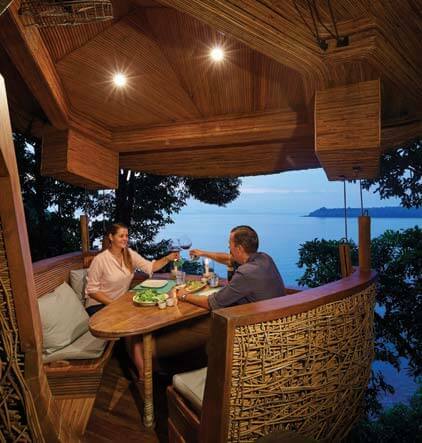 Soneva Kiri’s treepods take dining to new heights – literally. This out-of-the-ordinary experience allows diners to recapture the freespirited nature of childhood, harnessing what Soneva calls “that desire to climb high up into a leafy canopy and find shelter amid a simple wooden construction where imagination soared and dreams were born”. The pair of you will be gently hoisted into the tropical foliage of the ancient rainforest before being seated in a safe and comfortable bamboo treepod overlooking the shoreline. Your waiter will come and go by zipline, bringing whatever gourmet delights your hearts desire. 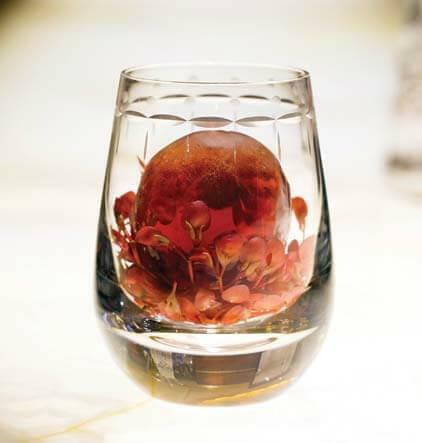 Fine dining by candlelight in Paris is hard to top when it comes to a romantic night out, but the devil is in the detail. 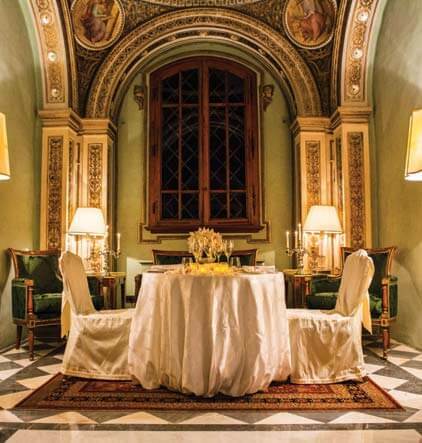 Intimate and elegant, Il Carpaccio has been welcoming amorous couples through its doors since 1983, becoming a culinary icon as revered for its Michelin-starred gastronomy as it is for its Sicilian baroque-style decor. The glass conservatory opens to the Parisian sky both night and day, with impeccable service and delectable Italian dishes likely to turn a meal at this enchanting venue into a cherished experience – made better yet by Pierre Hermé’s dessert pastries. There’s something in the air in the Greek Islands that leads to lightness, laughter and lingering looks, and Santorini offers just the picturesque setting that holidaying couples crave for a night out to remember. 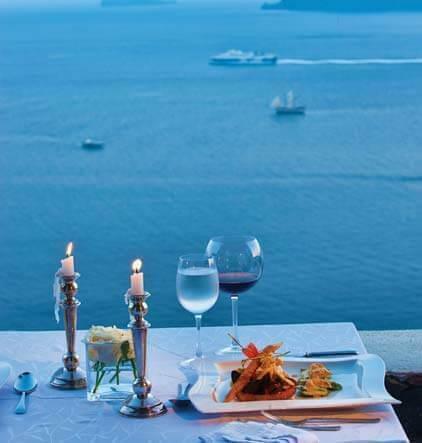 Petra Restaurant’s candlelit Panorama Balcony overlooks the shimmering blue Aegean Sea, but as night falls and the water fades to black, a veil of stars sets the scene for connection. The sophisticated menu of refined Mediterranean fare – with the requisite Greek influences – will impress the most committed of foodies. Falling under love’s spell is almost inevitable during a private terrace dinner on the Ponte Vecchio, the signature arch bridge spanning the Arno River in Florence. In its quest to offer guests extraordinary experiences, Four Seasons Hotel Firenze has secured exclusive access to the bridge’s only open-air terrace. A decadent four-course menu is only fitting for such a sublime setting, and Michelin-starred chef Vito Mollica prepares the meal on site. After a dessert starring glittering gold, browse for a keepsake downstairs at jewellery boutique Dante Cardini.